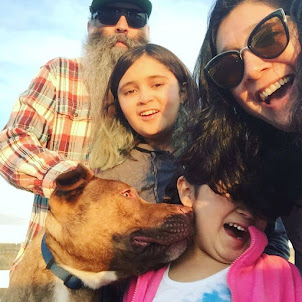 In an effort to spend more time with The Phis god-parents we headed out to Anaheim to check out a new place called Muzeo. 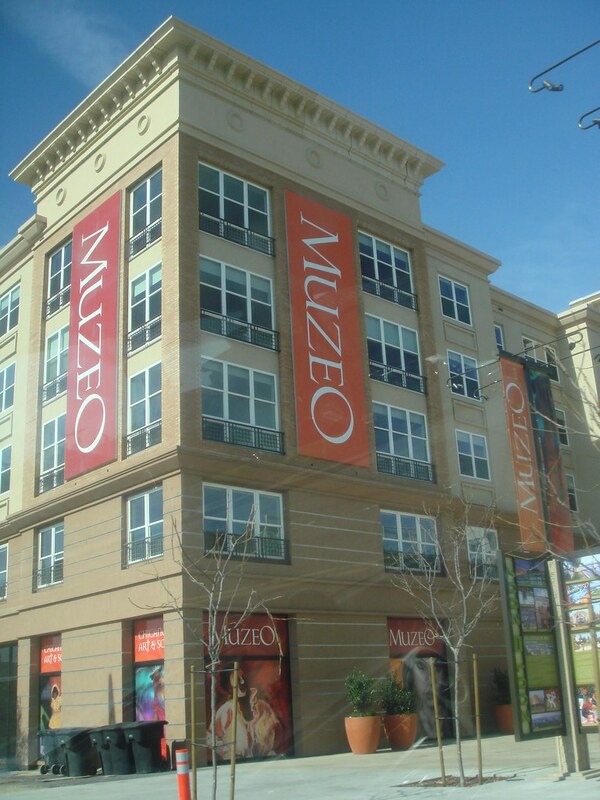 An interactive Chicano museum. Here is The Phi, hitting the switches. 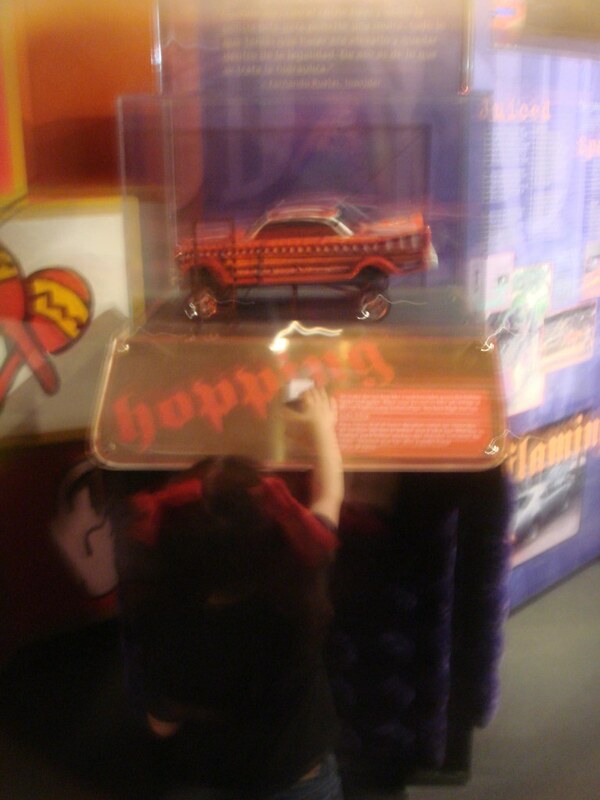 No only did they have this little exhibit, but they had a simulated lowrider. Patty and I hopped in and watched a video narrated by Cheech Marin and got to feel what it was like to sit in a lowrider while hitting the switches. 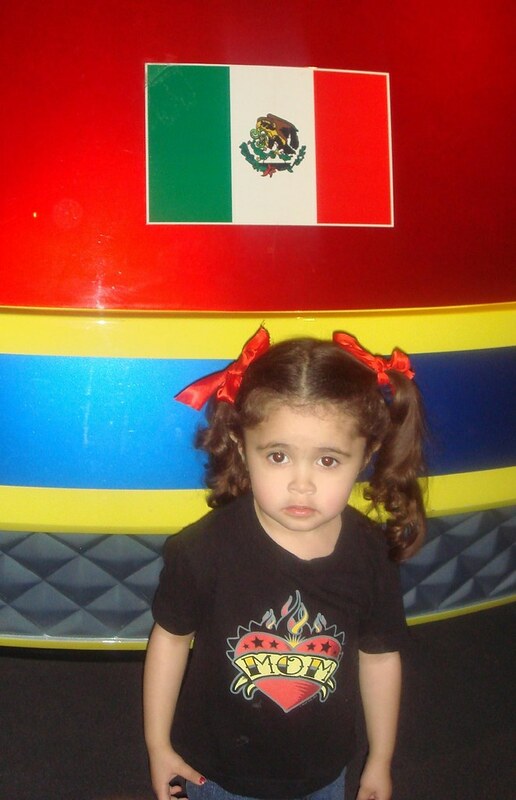 Mexican Pride. It was everywhere! The Muzeo was set up to be very kid friendly. It took The Phi a few mintues to get use to all the sounds and the dim lighting. ( I blame the dim lighting for Pattys like mix up!) But once she did, she had a blast pushing buttons, turning cranks and running around like she owned the place. One exhibit room was set up like a typical Chicano house. With a kitchen with cabinets filled with El Pato sauce and with refired beans and menudo on the stove. The living room area was complete with Virgen altar. An showcase of Chicano books. I think between Patty and myself we had them all! A diner set up with juke boxes filled with all the lowrider oldies! 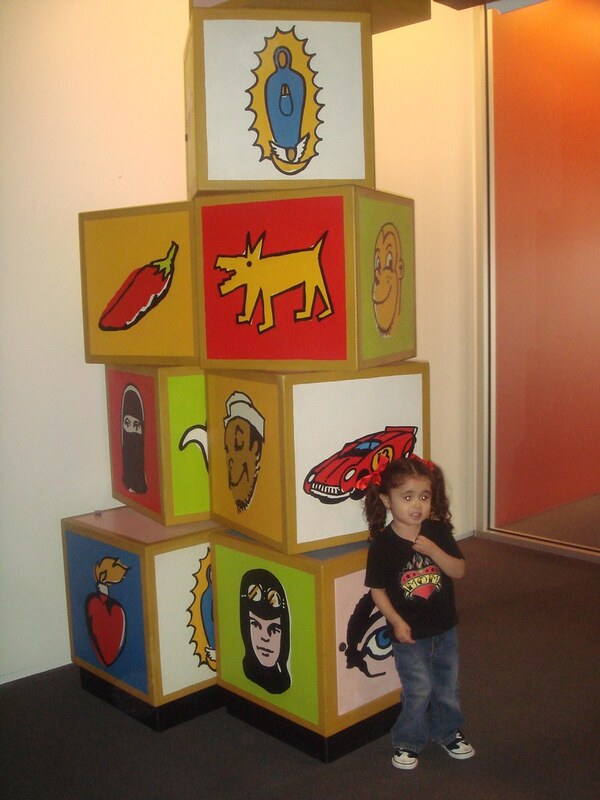 I loved these big brightly painted blocks. I mean a skull and Frida. Perfect! My crew heading out for a lunch break. When we got back they had a Ballet Flokorico dance group perform. The kids ages ranged from 3-20 something. Gorgeous dresses. We then headed into the art gallery to wander around and enjoy the Chicano Art and Soul exhibit. Cheech Marin, (yes of Cheech and Chong) fame has one of the best collections of Chicano art. A lot of beautiful, powerful, political, and even funny pieces. There was a lot of George Yepes (Cari remember him!) and Leo Limon were some of my favorites! Too much excitment. She wore herself out. That last pic of you holding your daughter all tuckered out, under that other work of art, is amazing! what an awesome place! me wants to go and take AJ!